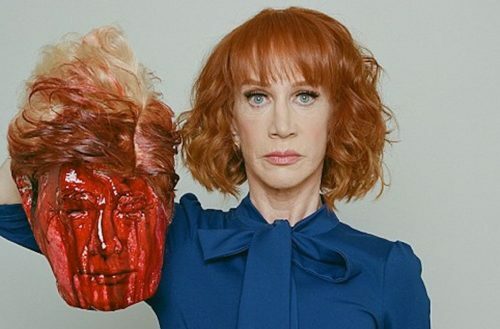 Earlier this year, Kathy Griffin found controversy with a viral photo of her holding up the bloodied, severed head of Donald Trump. Griffin later apologized — saying she “went too far” — but she lost her gig hosting CNN’s New Year’s Eve show. She also lost an endorsement deal with Squatty Potty. 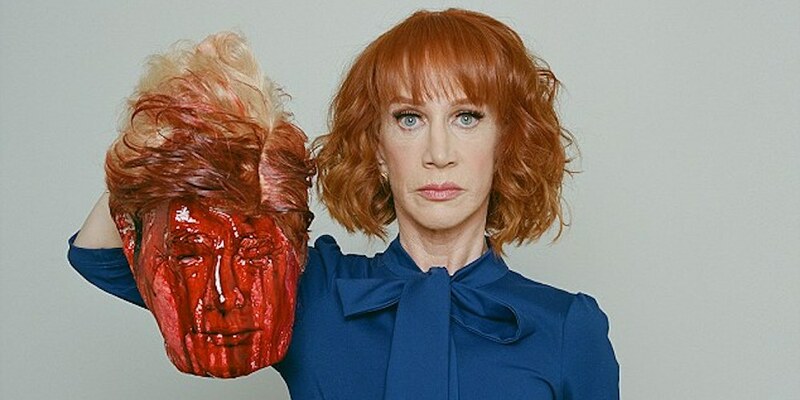 The Secret Service ultimately completely exonerated Griffin for the photo. The damage was done, however. She’d received a number of death threats. Promoters cancelled tour stops. She ended her friendship with Anderson Cooper over his lack of support. Still, the photo remained popular. Sharon Needles riffed on it during a live show. And now, photographer Tyler Shields is planning on cashing in. He claimed an art collector offered $150,000 for an original print. Shields turned him down, however — because he’s going to sell his own prints of the image. We don’t know Shields’ intended price for the prints, but we do know the size. He wants to make the prints huge — 72 inches by 52 inches. Shields is no stranger to controversy himself. He’s been accused of plagiarism multiple times. One of his photographs even fooled Google’s image search. How warped and misguided I was. My stupidity is overwhelming. Griffin never sent this letter — opting instead to share it on Facebook as an example of the crazy stuff she got over the photo. We’ve yet to see any calls for Shields to apologize, however. We’re not saying it’s sexism but it’s totally sexism. Shields owns the rights to the photograph, so he doesn’t need permission from Griffin to sell the image. It’s unknown whether or not she’ll make any form of royalties off the prints.